Everyone has different skills, knowledge and experience which they have acquired throughout their life. Our Club welcomes those special skills because it’s a ‘win win’ situation whereby the member makes new friendships and the club benefits. 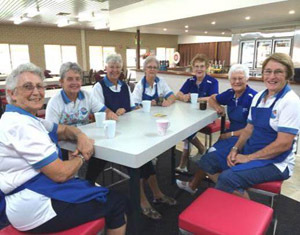 This Club relies heavily on the help of volunteers for its bowling activities as well as the running of events & maintenance activities. Our Club provides ‘on the job training’ from current members. Also, it pays for certain training courses if members wish to attend and there is a legal requirement to do so. Thus, members don’t end up out of pocket. 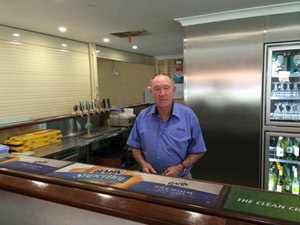 Volunteering in the bar begins the week usually at about 6.00 am on a Monday. Here a regular group of about eight people rise early to give the bar a good start for the week. The shelves are restocked, stock records are taken, the beer pipes are flushed, the mats are washed & the general area is washed & cleaned. The willing bunch of helpers is led by Darryl & Colin with Colin even 'Mr. Sheening' the bar timber surface. All of this happens before the bar is actually open for business. 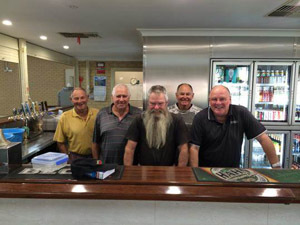 Once the patrons & Members start arriving you will almost always see at least one volunteer as well as the regular bar staff helping serve. Of course there is the requirement of RSA (responsible serving of alcohol) certification for all people serving alcohol. Busy times like Friday social & pennant days are when volunteers are especially welcome & appreciated. Our lovely clubhouse needs ongoing maintenance. There always seems to be a door closer not working or something else need attending to or even a bit of tender loving care. Somebody with a few handyman skills is always welcome. Please put your hand up. This area covers greens maintenance and gardening. The main time for this project is from about 7.00 am Monday morning. It is an ongoing requirement so it is every Monday morning for a group of about 15 people. Greens are rolled if required, greens are watered if required. There is always rubbish blown into the ditches so these are vacuumed or raked. Rubbish bins are emptied on a regular rostered system & the rink markings are shuffled to spread the wear load. The small amount of grass is mowed, shrubs are pruned & gardens are weeded & attended to so any green fingered person (M or F) is always welcome. Of course Monday is not Monday without morning coffee & a slice of toast (reputed by many to be the 'world's best toast'). The morning makes a good start & a lot of world problems have certainly been solved here. 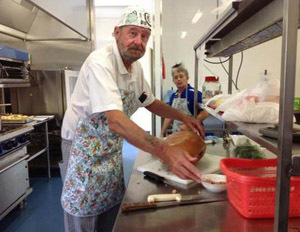 The Club does have Paul doing the catering on Friday Social but when there is a club activity, like a big bowling event, the catering is almost always done by a bunch of volunteers led by either John, Coral, Maureen, Lena or Norrie. Of course this comes with a kitchen full of choppers, peelers, dish washers, servers etc. Heaps of them, and all gratefully appreciated. There is always room for someone in the kitchen during a function. If you get the calling, please come along. Arranging our social calendar throughout the year takes a regular & continuous effort. The ring leader here is Robyn with helpers like Bob, Maureen & Pat who start on Friday morning positioning & setting tables. Julie, Maree & Renea are usually there as well but not on this occasion. During Friday social night, Pat comes to the fore to keep an eye on lights, audio, kitchen & Chase the Ace. There is a raffle roster on Friday night so if you can distribute tickets & take money you are welcome to join the roster. 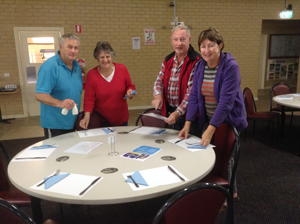 Now possibly the biggest in Mandurah, held each Thursday evening, this event takes a considerable number of volunteers ably led by John. In all about 17 volunteers help run bingo on a Thursday night. The duties include caller, call back, money handlers, ticket sellers, kitchen staff to name a few. Of course there is John to make sure the event happens as good as it does. That's not including the helpers on Thursday morning shuffling tables & chairs to get the show on the road. If you could possibly spare an hour or two on Thursday night or Thursday morning instead of watching telly, give John a call, he could always do with some help for this vital function. The Club has office staff including Greg the Treasurer, Louise the Secretary, however, if you have computer skills, general office skills or can see yourself in an air conditioned office with a comfortable chair & lovely view, we would like to ring your bell. There is always holiday time or short terms when meetings have to be attended so if you can help, please let the office know. There are a number of match events throughout the year in winter & summer. People are required to run these events that can range from a two day carnival to a regular single event. Of course you can't forget Harvey's jokes on Friday Scroungers that seem to attract more participants than the game itself. Clubs don’t run by themselves, we need active committees. The Club ethos is to minimize running costs and therefore membership fees through volunteers. If everyone was to volunteer just 1 hour a week our Club would receive approximately 750 volunteer hours weekly. Finally, we do have an annual volunteer appreciation function where all Club volunteers are provided complimentary food and refreshments and are formally thanked for their efforts during the year. Thank you – Your help is always appreciated. We don't pay our Volunteers because they are worthless, we don't pay them, because they are PRICELESS!